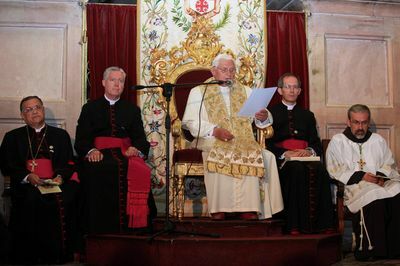 "Here the History of Humanity Was Decisively Changed"
JERUSALEM, MAY 15, 2009 (Zenit.org).- Here is the text of the address Benedict XVI gave today during a visit to the Holy Sepulcher in Jerusalem. The hymn of praise which we have just sung unites us with the angelic hosts and the Church of every time and place -- "the glorious company of the apostles, the noble fellowship of the prophets and the white-robed army of martyrs" -- as we give glory to God for the work of our redemption, accomplished in the passion, death and resurrection of Jesus Christ. Before this Holy Sepulchre, where the Lord "overcame the sting of death and opened the kingdom of heaven to all believers", I greet all of you in the joy of the Easter season. I thank Patriarch Fouad Twal and the Custos, Father Pierbattista Pizzaballa, for their kind greeting. I likewise express my appreciation for the reception accorded me by the Hierarchs of the Greek Orthodox Church and the Armenian Apostolic Church. I gratefully acknowledge the presence of representatives of the other Christian communities in the Holy Land. I greet Cardinal John Foley, Gran Master of the Equestrian Order of the Holy Sepulchre and also the Knights and Ladies of the Order here present, with gratitude for their unfailing commitment to the support of the Church's mission in these lands made holy by the Lord's earthly presence. Saint John's Gospel has left us an evocative account of the visit of Peter and the Beloved Disciple to the empty tomb on Easter morning. Today, at a distance of some twenty centuries, Peter's Successor, the Bishop of Rome, stands before that same empty tomb and contemplates the mystery of the Resurrection. Following in the footsteps of the Apostle, I wish to proclaim anew, to the men and women of our time, the Church's firm faith that Jesus Christ "was crucified, died and was buried", and that "on the third day he rose from the dead". Exalted at the right hand of the Father, he has sent us his Spirit for the forgiveness of sins. Apart from him, whom God has made Lord and Christ, "there is no other name under heaven given to men by which we are to be saved" (Acts 4:12). Standing in this holy place, and pondering that wondrous event, how can we not be "cut to the heart" (Acts 2:37), like those who first heard Peter's preaching on the day of Pentecost? Here Christ died and rose, never to die again. Here the history of humanity was decisively changed. The long reign of sin and death was shattered by the triumph of obedience and life; the wood of the Cross lay bare the truth about good and evil; God's judgment was passed on this world and the grace of the Holy Spirit was poured out upon humanity. Here Christ, the new Adam, taught us that evil never has the last word, that love is stronger than death, that our future, and the future of all humanity, lies in the hands of a faithful and provident God. This ancient Memorial of the Anástasis bears mute witness both to the burden of our past, with its failings, misunderstandings and conflicts, and to the glorious promise which continues to radiate from Christ's empty tomb. This holy place, where God's power was revealed in weakness, and human sufferings were transfigured by divine glory, invites us to look once again with the eyes of faith upon the face of the crucified and risen Lord. Contemplating his glorified flesh, completely transfigured by the Spirit, may we come to realize more fully that even now, through Baptism, "we bear in our bodies the death of Jesus, that the life of Jesus may be manifested in our own mortal flesh" (2 Cor 4:10-11). Even now, the grace of the resurrection is at work within us! May our contemplation of this mystery spur our efforts, both as individuals and as members of the ecclesial community, to grow in the life of the Spirit through conversion, penance and prayer. May it help us to overcome, by the power of that same Spirit, every conflict and tension born of the flesh, and to remove every obstacle, both within and without, standing in the way of our common witness to Christ and the reconciling power of his love. With these words of encouragement, dear friends, I conclude my pilgrimage to the holy places of our redemption and rebirth in Christ. I pray that the Church in the Holy Land will always draw new strength from its contemplation of the empty tomb of the Savior. In that tomb it is called to bury all its anxieties and fears, in order to rise again each day and continue its journey through the streets of Jerusalem, Galilee and beyond, proclaiming the triumph of Christ's forgiveness and the promise of new life. As Christians, we know that the peace for which this strife-torn land yearns has a name: Jesus Christ. "He is our peace", who reconciled us to God in one body through the Cross, bringing an end to hostility (cf. Eph 2:14). Into his hands, then, let us entrust all our hope for the future, just as in the hour of darkness he entrusted his spirit into the Father's hands. Allow me to conclude with a special word of fraternal encouragement to my brother Bishops and priests, and to the men and women religious who serve the beloved Church in the Holy Land. Here, before the empty tomb, at the very heart of the Church, I invite you to rekindle the enthusiasm of your consecration to Christ and your commitment to loving service of his mystical Body. Yours is the immense privilege of bearing witness to Christ in this, the land which he sanctified by his earthly presence and ministry. In pastoral charity enable your brothers and sisters, and all the inhabitants of this land, to feel the healing presence and the reconciling love of the Risen One. Jesus asks each of us to be a witness of unity and peace to all those who live in this City of Peace. As the new Adam, Christ is the source of the unity to which the whole human family is called, that unity of which the Church is the sign and sacrament. As the Lamb of God, he is the source of that reconciliation which is both God's gift and a sacred task enjoined upon us. As the Prince of Peace, he is the source of that peace which transcends all understanding, the peace of the new Jerusalem. May he sustain you in your trials, comfort you in your afflictions, and confirm you in your efforts to proclaim and extend his Kingdom. To all of you, and to those whom you serve, I cordially impart my Apostolic Blessing as a pledge of Easter joy and peace.